Discovered a problem when drawing in different scales using scale/translate transform. 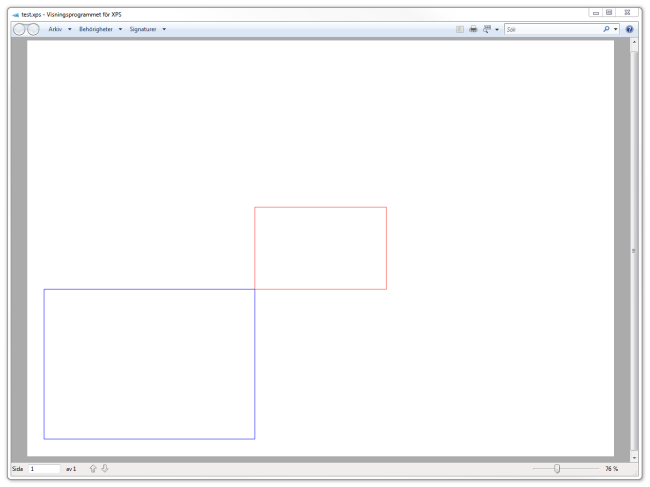 In this example we draw two rectangles in different scales, generate a XPS from FixedDocumentSequence and finally convert the XPS to PDF using PDFsharps XPS converter. // Generate XPS from DocumentSequence. Complete program can be found here and VS solution here. 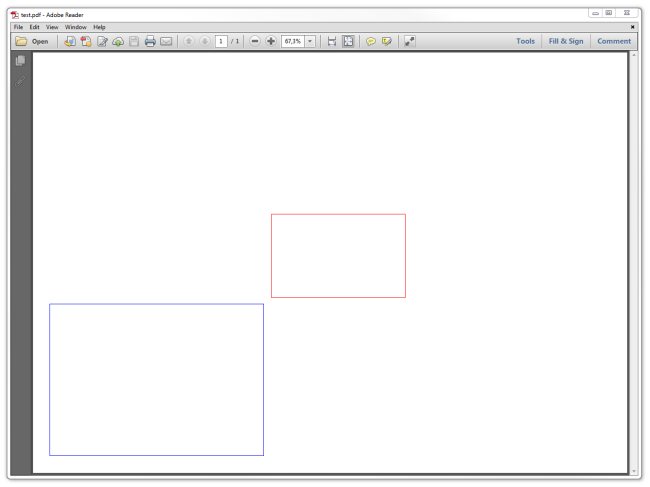 But in the generated PDF we get a gap between the two rectangles. The problem is most obvious when drawing a long way from origin, in this example the red rectangle is placed at 160000;130000 in a scale of 1:85. The gap becomes larger the longer from origin you draw, could it be a precision/rounding error? I've tried to resolve this problem without success. Any help finding the cause would be greatly appreciated! 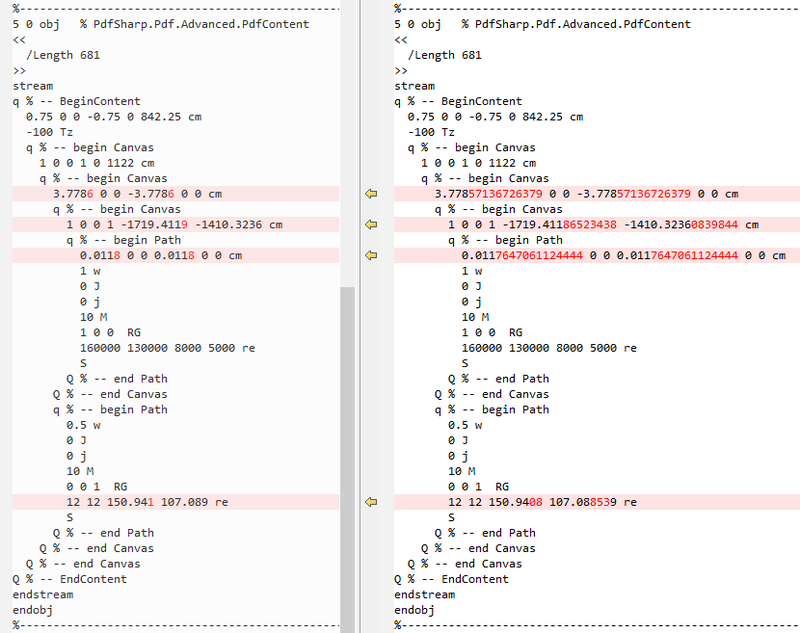 Note, I'm not sure if the problem is with the PDFSharp rendering or the XPS conversion. I'm using PDFSharp 1.31 (newer versions doesn't include the XPS support). Complete Visual Studio solution with this example (including PDFSharp lib) is available here. Note, I posted this on stackoverflow as well, but no answer so far. Hope you guys are able to help me. Last edited by salle55 on Wed Mar 22, 2017 12:34 pm, edited 1 time in total. The XPS folder from the 1.31 source code can be copied to the 1.32 source code. It may require some renaming when used with version 1.50. But I think that won't make any difference with respect to your issue. I cannot say anything about your transformation issue. I'll let you know when I get any feedback. Good to know, will try with 1.32 and possibly 1.50. Have tested with 1.32 now, same issue unfortunately (copied the XPS folder as you suggested). The complete VS solution with 1.32 and the test can be found here. Would very much appreciate if someone could take a look at this. I added a bounty on the stackoverflow question BTW. Found the cause, PDFSharp is rounding the transform matrix values to 4 decimals which is not enough in this case. When manually adding more decimals for greater precision, the PDF renders correct. Modified PdfSharp.Xps.Rendering.PdfContentWriter to output 8 decimals instead of 4 and it works! Good catch! Searching through the code I see a lot instances where numbers are formatted to only 3 decimal places. I suppose that could be appropriate for some things and not appropriate or adequate for others. Good catch! Searching through the code I see a lot instances where numbers are formatted to only 3 decimal places. Are you referring to the current version 1.50?